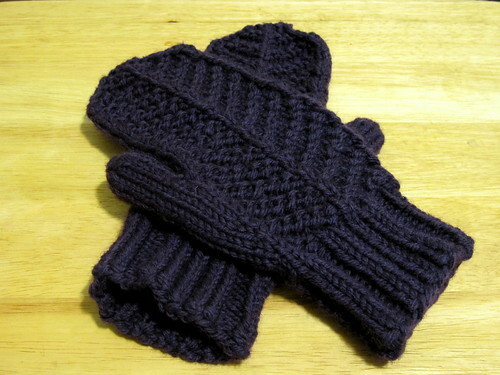 This weekend, I decided it was time I knit myself a new pair of mittens. I lost one of them a few weeks ago when we got slammed with snow. I had hoped I would find it, but after a few weeks of looking, I figured it was gone for good and it was time for a new pair. It was really time for a new pair anyway since these were getting pretty worn out. The pair I had were the pair I knit back when I was still pretty new to knitting, so they are at least 3 years old, probably more. They’ve seen quite a few winters and were starting to felt pretty good! I came across the Pescovegetarian mittens pattern a week ago and knew right away this was the pattern I wanted to use to make my replacement mittens. I had some Patons Classic Wool in my stash for just this purpose. A very pretty purple. 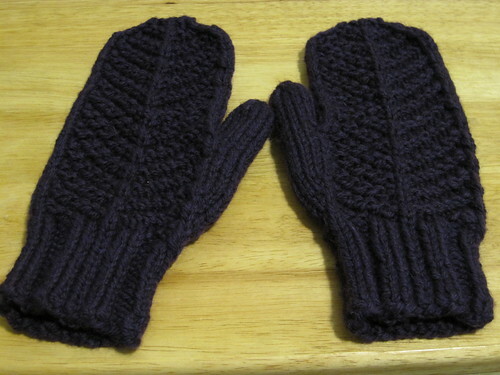 I knew I wanted bulky mittens, similar to my last ones, which were also knit with Patons Classic Wool (in bright pink), held double. My plan was to use the Patons Classic Wool held double. 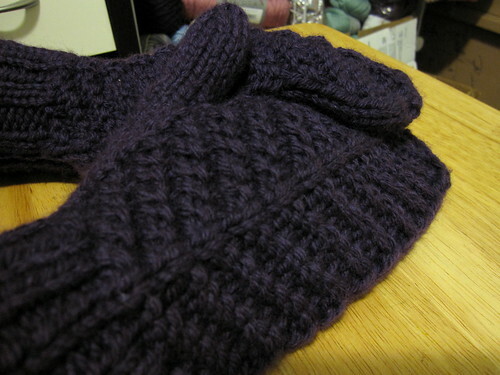 Looking at the mittens, they seemed a bit bulky and I was afraid that using US 10’s might make the fabric a bit too loose or be too loose on my hands (I have fairly small hands). So, I decided to make some modifications. The modifications I made ended up turning out great and I love the end result! 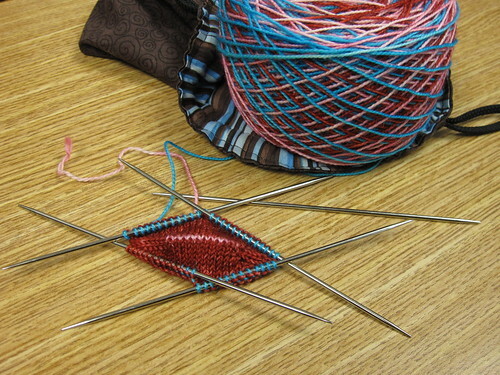 After knitting the two rounds after the 2nd increase round, do another increase round like this: at the beginning of the second needle, k1, m1, k6, m1, knit to end of round. After the increase round, work 8 rounds (or until you get to the base of your thumb). I chose to kitchner/graft the top of my mitten because I couldn’t get the yarn tight enough to make no gap. I ended up liking the way this looks better. For the thumb, work as indicated, picking up the 6 stitches above and around the thumb hole. The very first round, decrease those 6 stitches to 4 so you have a total of 12 stitches. Work as many rows as needed to get to the tip of your thumb then work two decrease rounds as follows: 1st round, ssk, k2, k2tog, ssk, k2, k2tog, k2. 2nd round, ssk, k2tog, ssk, k2tog, k1. 5 stitches remain, pull yarn through the 5 stitches and pull tight to close up. I liked the way this looked better than decreasing them all at once. I really love how these turned out. They fit great! I got to try them out this morning since it was about 25 degrees out! Kept my hands nice and toasty just like the old ones did. I thought I’d give a brief update on how I’m doing with the goals I gave myself this year. Read 1 book for the month of January (Fun Home: A Family Tragicomic by Alison Bechdel) and I’m a good way through my second book for February (Enchantment by Orson Scott Card). I’m also reading Getting Things Done by David Allen, but it’s taking me a while to get through it. I have kept up with the one photo per day goal. I think I’ve done a good job blogging (though I’d like to be more “regular” here still). I knit a swatch for a sweater, but decided it looked to much like Christmas colors. There’s a new KAL coming up for colorwork, though, so I have plenty of time to get that in (after all, it is only February). Haven’t knit a sweater or lace yet. Haven’t worn my handknit socks yet. Did 3 meals in the crockpot, but ended up scratching this goal. The reason I bring any of this up is that last one there. The crockpotting. Don’t get me wrong, I do like the crockpot. Matt wasn’t really wrong when he said I was trying to go too far with it, too exotic for a crockpot (with things like lasagna that ended up really greasy and not very good). He’s right. There’s plenty of things I could make that I already know that I like and maybe expand a bit from there. Perhaps I was approaching it totally wrong. It’s okay, though. My crockpot hasn’t been banished from the kitchen, but I have a much better idea what I’d like to do with it. Soups, stews, chili, roasts, whole chickens… that sort of thing. Haven’t done it yet, but soon! 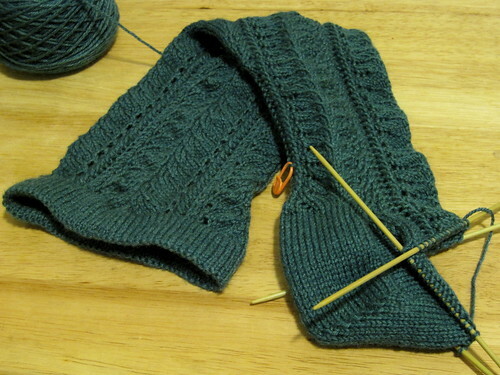 I started a pair of socks for the Knitting Purls Toe-Up KAL that started today. I decided to use the Knitterly Things Vesper Sock Yarn in the “Love Stinks (Yeah Yeah)” colorway. I like how it’s going so far. I started with 24 stitches (12 each side) and knit the first row, increased every row for 6 rows, and now I’m working on increasing every other row until I get the number of stitches I want (haven’t determined that yet). Kinda making it up as I go along! 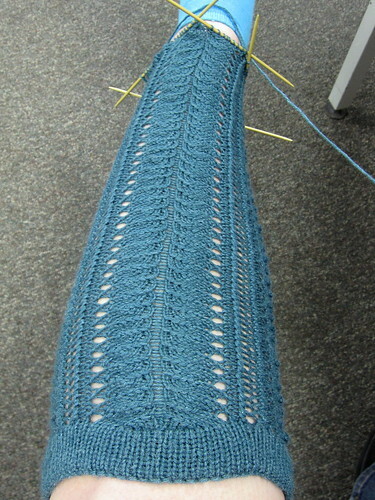 Previous Post Lakeside Socks, Louet Spindle, and… a Babe wheel? Crockpots can be hit or miss. I tend to stick to the same general things with it and I really like the cookbook I have for it. And it’s nice to revisit goals and modify them if necessary. Looks like you’re doing great!